Pic shows Richard Moore keynote speaker at the launch of Catholic Schools Week with 3rd year Mount Mercy College student Sara Ann Biju. Pic John Mc Elroy. The General Secretary of Catholic Primary School Managers Association (CPSMA) warned on Monday of the dangers of league tables as Catholic Schools Week 2016 was formally launched in Cork. In his homily at Mass in the Church of the Descent of the Holy Spirit, Fr Tom Deenihan noted that in recent times the issue of league tables had come to the fore again. He warned that the danger with this approach to educational success is that we value the educationally gifted and shun those who are not, he told the packed church. People, he said, are not clones, are not stereotypical and so, it follows, that people and students … are not ideal, not perfect, and, dare I say it, sometimes not even holy. Fr Deenihan told the congregation of student representatives as well as teachers and members of the education sector that a Catholic school must treat all its students equally, must value all the different talents and abilities of its students equally and, “if it were to be biased at all, would be biased in favour of the weak”. Inclusion, he emphasised, is not just about religious denomination but also takes nationality, ethnicity, socio-economic background and ability into consideration. “When these five criteria are taken into consideration, I would challenge anyone to tell me that Catholic Schools are not as inclusive as any other type of school. They must be to be true to their ethos! Indeed, a recent ESRI publication on School Sector Variation in Ireland bears adequate and independent testimony to this,” he said. The Mass was concelebrated by Bishop John Buckley of Cork and Ross, Bishop Brendan Kelly, Chair of the Council for Education of the Irish bishops, Bishop William Crean of Cloyne, Bishop Leo O’Reilly of Kilmore and Mgr Jim Cassin, Executive Secretary of the Council for Education. 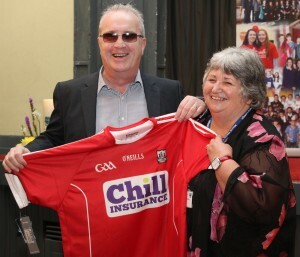 Pic shows Richard Moore being presented with a Cork jersey by Mount Mercy College principal Padraigin ui Riordain. Pic John Mc Elroy. Speaking to CatholicIreland.net at Mount Mercy College after the launch of Catholic Schools Week on the theme ‘Catholic Schools: Challenged to proclaim God’s Mercy’, Bishop John Buckley said that opposition to the divesting of Catholic patronage tended to come from parents and local politicians. “I can see the need for greater choice for parents,” he said and added that in Cork the process was likely to take place through amalgamations. Bishop Buckley also highlighted that Catholic schools tend to be leaders in reaching out to the Travelling Community through Traveller education and in providing for special needs. 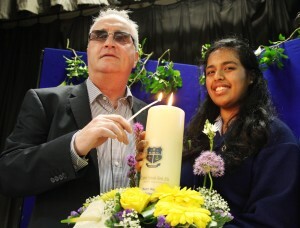 In his homily, Fr Tom Deenihan referred to one catholic primary school in Cork, St Mary’s of the Isle, which has 265 pupils from 38 different nationalities and 10 faith denominations as well as atheists, and this included 40 Muslims and 11 Hindus. A Department of Education whole school evaluation at the end of January had surveyed parents and 100% of the parents who responded indicated that they were very happy with the school. “I think unfortunately the narrative has been created that inclusion is about faith denomination or faith affiliation,” Fr Deenihan commented. Asked about concerns within the Catholic sector that it was being undermined, Fr Michael Drumm, Chairperson of Catholic Schools Partnership, said that some members of the school community would feel that there is “constant criticism of them in some organs of the media – but that might be for various historic and cultural reason”. He also said baptism as an entry criterion “is not a major question in our experience on the ground” and that the number of schools that use faith affiliation as a criterion “is very few”. “Obviously if you are a Catholic school in a very busy parish and the school is oversubscribed by Catholics who want to go to it, then they will object strongly if others were to get places ahead of them,” he explained. 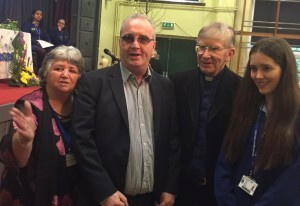 In his keynote address for the launch in Mount Mercy College, Richard Moore, founder of the Children in Crossfire charity, who was blinded as a ten year old boy in Derry in 1972 by a rubber bullet fire by a member of the British Army, urged student representatives attending the launch to use Catholic Schools Week to do things a different way and promote mercy and forgiveness. Catholic Schools Week will run from Sunday 31 January to Saturday 6 February 2016, and is an all-Ireland annual event which invites Catholic schools to give expression in a special way to the ethos of Catholic education. Mount Mercy College Cork has eight-hundred students with sixty staff. The school was founded in 1965 under the trusteeship of the Sisters of Mercy. This will be the first time that a school in Cork hosted the national launch of Catholic Schools Week.